Australia offers a high quality of life and excellent employment opportunities, so it is no wonder that so many people from overseas want to come to work in the country. In order to live and work in Australia, you have to be granted a working visa, so this article helps you to find out how to get Australian working visa, lists the different types available and tells you the requirements that you must meet. Most categories of visa require applicants to have sponsorship from an employer, a regional area or a relative. The temporary work visa requires sponsorship from an employer and will grant the worker the right to work in the country for up to 4 years depending on their contract. Although this visa is not points tested it does require the worker to have an occupation that is on the skills shortage list. Requiring sponsorship from an employer, this type of visa can grant permanent residency. There is no point testing however there are a number of requirements which must be met. The applicant must pass a skills test, have had 3 years work experience, must have competency in English language, be aged under 50 and must be working in an industry on the shortage skills list. This permanent visa requires sponsorship from a regional employer. The other requirements are the same as those necessary to be eligible for the Employer Nomination Scheme Visa. Although this type of permanent visa does not require sponsorship, it requires applicants to have gone through the Skill Select procedure. The applicant's work experience must be within one of the shortage skills categories and they must possess good English skills. They must also be aged fewer than 50 and must be invited to apply. Very similar to the Skilled Independent visa, the only difference is that the applicant must be sponsored by a state or territory government in order to be eligible. This visa can last for up to 4 years and requires the applicant to have gone through the Skill Select procedure. They must be nominated by either an eligible relative or by a state or territory government. The applicant must be working in one of the shortage skills industries and must be aged fewer than 50 with good English skills. Many categories of visa require applicants to have used the Skill Select procedure. This is an online service which enables those who have skills that are in demand and are listed on the Consolidated Skills Occupation List to register an Expression of Interest in moving to Australia to work. No fee is charged for submitting an EOI, which enables the applicant to be discovered by Australian employers or local governments who are looking for your skills. This can lead to an invitation to apply for a visa with them acting as sponsor. 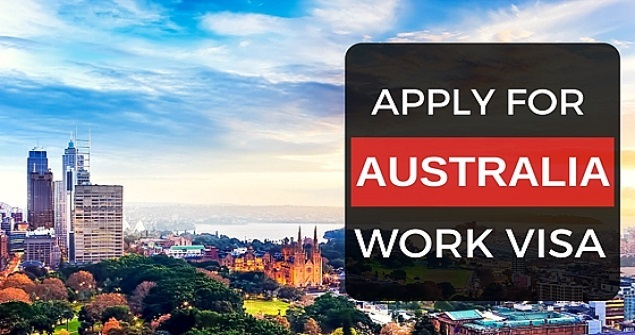 Anyone who wishes to only work for a short period in Australia can apply for one of several visa types. These include a Short Stay Activity visa for those who are planning on staying for only a short time frame and will be doing a highly specialized job, an Entertainment Visa for those employed in the entertainment industry, or a Long Stay Activity visa for those who are going to work in specific occupations, including high level sports competitions, domestic work for senior foreign executives, religious work or as part of a work exchange. For young people aged between 18 and 30 who wish to come to Australia to travel but also to support them by working, there is a working holiday visa which will allow the applicant to stay in the country for up to a year. You will need around AUD 5000 and must either possess a return ticket or have enough money to buy one.